The process of transcription is simply the conversion of spoken words or audio recording into a written text. 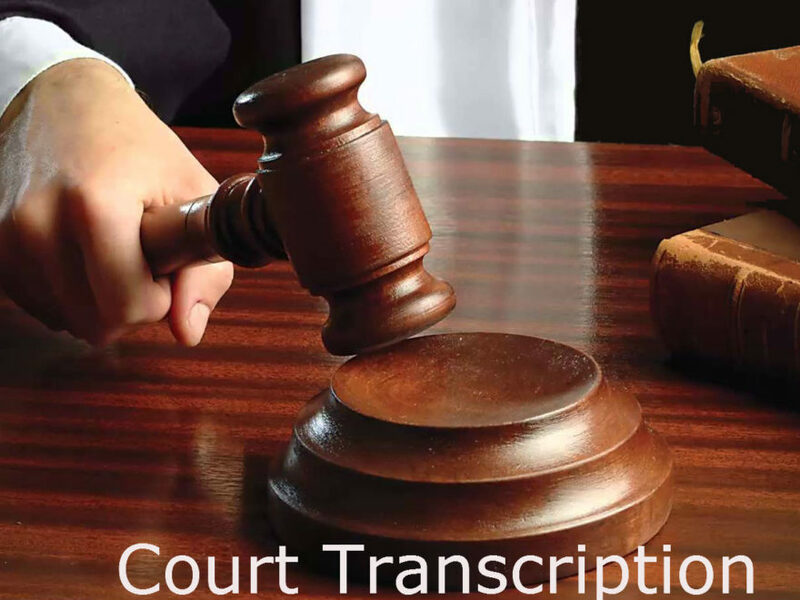 Court transcription is a specialized type of transcription that deals with the transcribing of any legal proceeding from spoken words to a legal document. The document can be used as evidence or proof that is admissible in the court. In a traditional court setting, the transcription is carried out by court reporters. They use stenography and other equipment to capture everything. In a legal proceeding, it is required to record in verbatim. Meaning to say even filler words are transcribed and recorded. This is crucial in making decision especially for the judge or the members of the jury. Today, however, court transcription has grown rapidly. Court transcription now caters to a broad range of legal proceedings like depositions, testimonies, interrogations, witness interviews, legal briefs and including general correspondence. The source material for court document transcription now includes audio tapes, digital recordings, and other modern storage equipment. Just like any other types of transcription, the transcribed in a court document transcription will first review the source file. The transcriber will have to listen to the audio recording presented to him intently. The transcribers need to write down exactly everything. A court transcriptionist should work with high precision and accuracy. Otherwise, the transcript will be useless and ultimately defeat its purpose as evidence. Accuracy is the most crucial part of any court proceedings. Everything that is being said and done inside the courtroom is documented and recorded. The transcript is one of the methods they use to record what has been said and done. As such, transcriptionists who are assigned in these proceedings are meticulous. They are well-aware of the enormous importance of an accurate transcript and this delicate task can never be undermined because one incorrect entry in a court report can mean a disaster. There was even a case between two competing companies just because of an error in the transcript. The traditional way of recording proceedings inside the court is through court reporters. They are professionals who are well-adept in stenography and shorthand methods. But the advancement in technology paved the way for using advanced recording equipment which will later be used for court transcription. Court transcription supports law firms, legal practitioners, law students, government agencies, trade associations, a non-profit organization, and meeting planners to name a few. To simply put, court transcription is one of the most in demand transcription service in the industry today. Never let your appeal go down the waste or be slow down by expensive online court transcripts. Get help from a reliable court transcription provider who can meet your requirements. Make sure only to hire transcriptionists who are vetted and background-checked. Otherwise, you’ll be putting your entire case at risk. There are many available providers out there who can deliver exceptional online court transcripts. There are many benefits in getting court transcription which includes a reduction in overhead cost, streamlined workflow, and shortening of delivery timeframes. When you hire professional court transcription providers, you’ll have the opportunity to receive customized transcripts based on what you need. Vanan Transcription is exactly what you need to deliver the best court transcription. They are powered by expert transcribers who have vast experience transcribing in for the legal profession. Never compromise quality and accuracy. Court transcription is what you need. To know more about court transcription, please call our toll-free hotlines or talk to u via online chat. Previous Post:How to Hire The Right Chinese Transcription Services?